Complete Tent Kit - Secret Jardin DS120 With Philips Bulb & Hesi Starter Pack. Kit DS 120 Simple Kit DS 120 + Hesi Starter Soil Kit DS 120 + Hesi Starter Coco Kit DS 120 + Hesi Starter Hydro Kit DS 120 + Wilma 4 XL 4 x 25L + Hesi Starter Hydro. Kit DS 120 Simple This tent comes with: 1 x 1 x Secret Jardin - Dark Street DS120 Rev 3 120x 120 x 185 cm 1 x Lumii Black - Digital Dimmable 600w 1 x Philips - 600w HPS Master Son-T PIA Green Power 1 x RAM RVK Kit (428m³) & RAM Carbon Filter 6 (150mmX475mm) - 10m Aluminium Ducting 2 x easy roll light adjusters to hang reflector 1 x Lumii Heavy Duty Timer & Contactor 1 x Digital Series - Digital Thermometer & Hygrometer. Kit DS 120 + Hesi Starter Soil This tent comes with: 1 x 1 x Secret Jardin - Dark Street DS120 Rev 3 120x 120 x 185 cm 1 x Lumii Black - Digital Dimmable 600w 1 x Philips - 600w HPS Master Son-T PIA Green Power 1 x 1 x Hesi - Starter Kit Soil 1 x RAM RVK Kit (428m³) & RAM Carbon Filter 6 (150mmX475mm) - 10m Aluminium Ducting 2 x easy roll light adjusters to hang reflector 1 x Lumii Heavy Duty Timer & Contactor 1 x Digital Series - Digital Thermometer & Hygrometer. Kit DS 120 + Hesi Starter Coco This tent comes with: 1 x 1 x Secret Jardin - Dark Street DS120 Rev 3 120x 120 x 185 cm 1 x Lumii Black - Digital Dimmable 600w 1 x Philips - 600w HPS Master Son-T PIA Green Power 1 x 1 x Hesi - Starter Kit Coco 1 x RAM RVK Kit (428m³) & RAM Carbon Filter 6 (150mmX475mm) - 10m Aluminium Ducting 2 x easy roll light adjusters to hang reflector 1 x Lumii Heavy Duty Timer & Contactor 1 x Digital Series - Digital Thermometer & Hygrometer. Kit DS 120 + Hesi Starter Hydro This tent comes with: 1 x 1 x Secret Jardin - Dark Street DS120 Rev 3 120x 120 x 185 cm 1 x Lumii Black - Digital Dimmable 600w 1 x Philips - 600w HPS Master Son-T PIA Green Power 1 x 1 x Hesi - Starter Kit Hydro 1 x RAM RVK Kit (428m³) & RAM Carbon Filter 6 (150mmX475mm) - 10m Aluminium Ducting 2 x easy roll light adjusters to hang reflector 1 x Lumii Heavy Duty Timer & Contactor 1 x Digital Series - Digital Thermometer & Hygrometer. Kit DS 120 + Wilma 4 XL 4 x 25L + Hesi Starter Hydro This tent comes with: 1 x 1 x Secret Jardin - Dark Street DS120 Rev 3 120x 120 x 185 cm 1 x Lumii Black - Digital Dimmable 600w 1 x Philips - 600w HPS Master Son-T PIA Green Power 1 x Hesi - Starter Kit Hydro 1 x RAM RVK Kit (428m³) & RAM Carbon Filter 6 (150mmX475mm) - 10m Aluminium Ducting 1 x Wilma XL 4 - 4 x 25L - 90x90cm 2 x easy roll light adjusters to hang reflector 1 x Lumii Heavy Duty Timer & Contactor 1 x Digital Series - Digital Thermometer & Hygrometer. EVERYTHING WE SEND OUT IS IN PLAIN PACKAGING.. Alternatively you are more than welcome to collect your order from our premises in cambridge and browse our shop which stocks over 1000 products. Items less than 2kg in weight can be sent throughout the UK and N. Offshore British mainland please message for a quote. And if you are unsure about the weight of your order please message first for a quote. 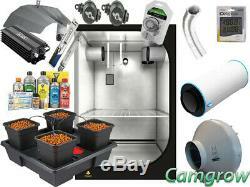 Welcome to CamGrow's online Hydroponics and Horticultural Superstore. We have thousands of products for all your hydroponic and horticultural needs available in our Cambridge shop and are busy adding them to this website. It is in original undamaged packaging with all tags intact. The product is in the same condition as how you received it. You have a statutory duty to take reasonable care of our goods whilst they are in your possession and during transit. The item "600w Complete Grow Tent Kits With Wilma XL Hydroponic System & Hesi Feeds" is in sale since Tuesday, February 12, 2019. This item is in the category "Garden & Patio\Hydroponics & Seed Starting\Tents, Tarps & Shelves". The seller is "fossie33" and is located in Cambridge. This item can be shipped worldwide.